SQUAMISH, BC – At a typical “tap takeover” event, a bar or pub will hand over all of its draught lines to a single brewery for a night. But one of British Columbia’s best loved brewpubs is getting set to host a happening that puts a unique twist on the concept. On Saturday April 27th, Howe Sound Brewing will be welcoming 16 guest breweries from across British Columbia – including Cannery, Canoe, Central City, Driftwood, High Mountain, Mission Springs, Moon Under Water, Parallel 49, Phillips, R&B, Salt Spring Island, Spinnakers, Steamworks, Storm, Townsite and Whistler – and giving each of them a tap line to fill. 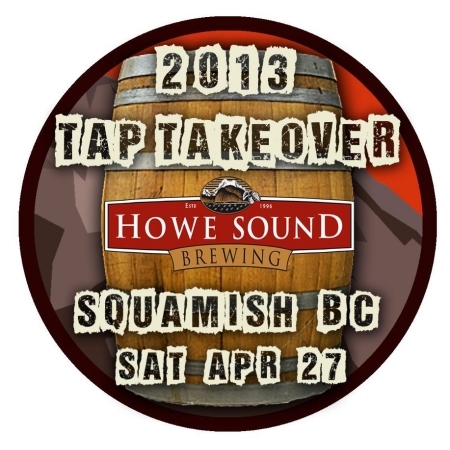 The Takeover starts at 4:00 PM, and the $10 admission includes a Howe Sound glass and 5 sample tickets. There will also be food available throughout the event, and live music by Celtic-punk band The Whiskey Dicks starting at 9:00 PM.